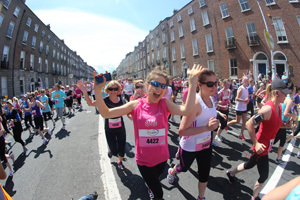 The 2013 Women’s Mini Marathon took place on Bank Holiday Monday, June 3rd and 300 participants took part on behalf of St. James’s Hospital on another beautiful mini marathon day. As temperatures soared, The O’Callaghan Stephen’s Green Hotel most generously threw open their doors to provide a before and after gathering place for happy St. James’s participants who met up with friends before setting off for the start line on Fitzwilliam Street, and then returned afterwards for massages, refreshments and congratulations. Women’s Mini Marathon in Dublin. First back to the hotel after the mini marathon was Sophie Conroy from Dundrum who completed the race in 55 minutes. RTÉ presenter, Bláthnaid Ní Chofaigh, is a strong advocate for St. James’s and ran the race for the hospital and then joined the happy throng for congratulations. And the talk of the day were the fashionistas from Drogheda; as always the ladies (!) brought great style to proceedings. The tired but happy and successful mini marathon participants were treated to post-race leg massages by physiotherapists from the hospital’s Department of Physiotherapy using Weleda’s Arnica Massage Balm – donated most kindly by Weleda – who had also sponsored lovely prizes for St. James’s participants in connection with the mini marathon. Later Bláthnaid drew the winning ticket in the raffle and presented lucky Angela James from Dublin with a voucher for a weekend for two at The O’Callaghan Stephen’s Green Hotel. St. James’s Hospital Foundation would like to thank all St. James’s 2013 mini marathon participants whose generous fundraising efforts are greatly appreciated, The O’Callaghan Stephen’s Green Hotel for their hospitality and their generous gift, and Weleda for the product they so generously gave for the day and for their lovely prizes and Cornmarket for their sponsorship of the posters.